Applications: This machine makes easy work of finishing recesses, corner welds and acute angles. It can be fitted with different abrasive products to remove welds, clean, grain, finish and polish metal in the most awkward areas. Ideal for hand rails, food and pharmaceutical equipment where hygiene specifications must be met, architectural hardware and many other fabrications. A long extention arm to reach in to recesses. Dual mounting wheel taking 150mm discs as well as standard 22.2mm discs. Fully variable speed motor for selecting the right speed for the job. 110V option, enabling on-site use. Spindle lock for quick change. 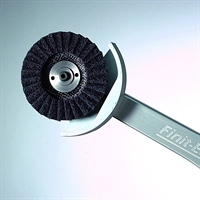 Also Available: The Finit-Easy can be used with 2 of Cibo abrasive's Time Saving Kits. These kits have been created to solve your abrasive and finishing problems and offer a complete solution which contains all abrasive and polishing products needed as well as access to videos and comprehensive step by step instructions. In addition, a comprehensive range of consumables for grinding and polishing as well as spare parts are available for the Finit-Easy. Please ask if in doubt.